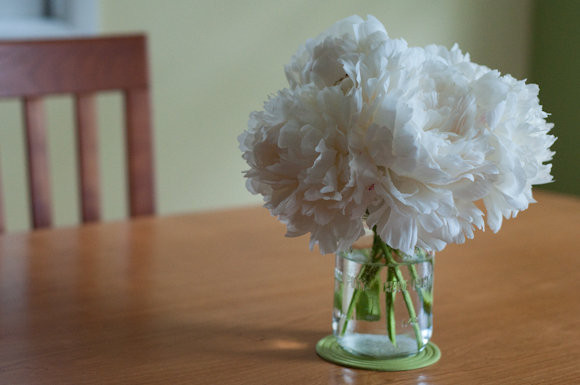 Peonies make me think of my grandma. * I don’t know why. I don’t remember her having them when I was a kid. But they bring her to my mind every time I see them. So a few years ago I planted a peony right in my garden. But the blooms don’t last very long at all. Maybe a week? They’re so lush and full. I couldn’t resist making them one of the first bouquets to grace our dining room table (see Greenery for the backstory on the floral newness). I went outside one evening and clipped several stalks, placing them in a bowl to carry back into the house. I trimmed all of them and plopped them into three different vases. I was chatting with my mom on the phone as I did this and let out an “Eeep!” when I spied a few bugs in the bowl. 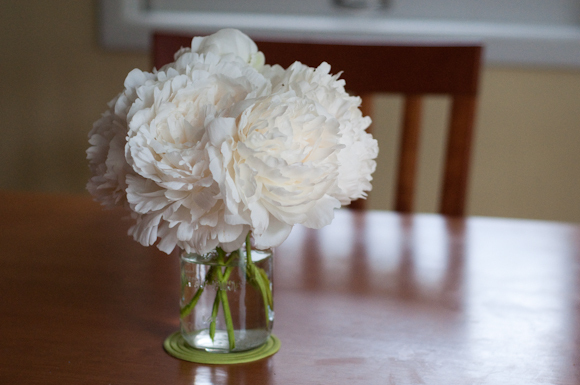 My mom proceeded to tell me that people don’t usually put cut peonies in their houses because of the bugs. Or, if they do, they hang the flowers upside down for a little while to get rid of them. *Queen Anne’s Lace, too. I always think of adding Queen Anne’s Lace to my garden. Don’t many people consider it a weed? Not me. I love it.